Automap off = all ok, Ableton, internal effects all work + record fine. VST's also respond and record automation fine, but obviously I cannot edit the templates properly in this mode. Automap on = VSTs appear to respond fine - sound changes as parameters are changed. However, visual updates and recording are 'jerky' - they update in big jumps or not at all, making it effectively useless for recording automation. I posted up an image of my Ableton MIDI prefs below in case I'm doing anything wrong... Tips anyone? Last edited by jomtones on Mon May 02, 2011 10:26 am, edited 2 times in total. What do you mean you can't get it to record? Where are you recording things? Arrangement View? Session View? Are you doing global record or recording individual clips?? Sorry - missed your reply, no notification for some reason. This is driving me crazy now - if I turn automap off, then the Ableton plugs all work and record just fine. Also, I can use VSTs fine - click on them, it displays a random bunch of their parameters and it all works. But if I turn automap on (the 'automap' button on the controller) - so that I can edit the layout of the parameters, nothing works properly - despite playing back changes in the audio fine, the plugins don't display parameter changes correctly and recording only works intermittently, with big jumps. Weird!!! First thing to try: Turn everything under midi remote/sync to do with automap to off. Actually since it's a Zero SL you don't even need track (that's for keyboard tracking). And just so you're clear, the top section under control surface in/out is only to do with Ableton's native instant mapping (blue hand control) and is for the Ableton Template (36 or 38 or whatever), but not to do with Novation automap. That's all handled by the automap server. As for the jumpiness, maybe you parameters are assigned with coarse increments. (You can change the step values in automap assignments. If I were you I would always make my own templates, the default ones are useless). Sorry - I don't follow - You mean turn it all off and then back on again, or leave it off? jomtones wrote: Sorry - I don't follow - You mean turn it all off and then back on again, or leave it off? Just turn it off. Leave only the row under control surfaces (if you want to use the ableton template that is). For novation automap of plug-ins, you don't need any of the midi in/outs or track. Hmmm ok well I'll give that a go ... would be nice to have both working! jomtones wrote: Hmmm ok well I'll give that a go ... would be nice to have both working! You can still have both working. The midi in/out is only for manual templates. If you are using novation automap you odn't need any of it in preferences. If you also want to use the ableton template, you only need the control surface set at the top. Everything in the MIDI section is off now apart from the 'Remote SL' section. They both sound the same while recording, but obviously the 2nd one, recorded with automap ON, sounds totally wrong on playback. what do you mean by non-automap ('universal'). Automap universal is the plug-in automap, where the automap light is on. Is non-automap using the ableton template with the 8 macros on the top left? Have you checked step resolution of the automapped parameters in automap mode (in the automap server window)? The one pictured was recorded using a fader and I can't see any step res controls on there... but surely it shouldn't be as crap as that, that would make the faders totally useless! Those jumps are like half a second. what if you start with a true empty set vs. a default template set? 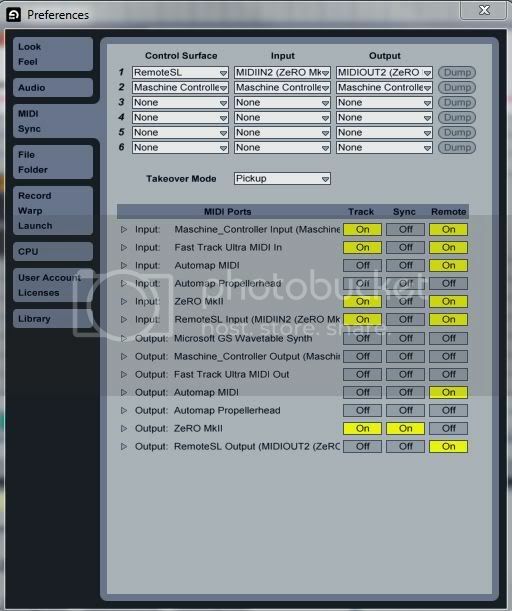 alternatively you could strip items (reverb, compressor, Operator, Sampler, etc. etc.) that are in your set one at a time and keep removing them until you find the culprit. Hmm I know what you mean but the stuff above was recorded in an empty set ... "Ableton / New Live Set" then Junglist was loaded as automap and I didn't make any changes to the template, just tweaked the filter. Same thing with the automap off.